With a relatively small network of schools statewide, North Dakota students benefit from online learning in multiple ways. Increased access to digital learning platforms, for example, has created a 91 percent increase in online course enrollment across all grade levels. Not only has this helped K-12 students get ahead, but it continues to foster post-secondary education via a more flexible degree-granting network of schools. Let’s take a look at online schools at both the K-12 and college levels in further detail. Due to the expansive and spacious landscape of the state, North Dakota’s higher education system recognizes the need for distance learning programs. Of the 17 post-secondary schools located throughout the state, which include five community colleges, six four-year public universities, and six private colleges, 10 offer degree programs that can be earned entirely online. The flexible format of online learning programs immerses students in an environment that is both enriching and convenient. While earning online, students will be able to complete their coursework at a time most beneficial to their schedule. 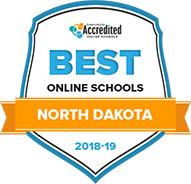 Below are some of the Best Online Colleges in North Dakota for 2018. Founded on the Benedictine ethic, the University of Mary is a professionally-focused institution, offering degree programs geared toward placing students in high-demand jobs. Their online school follows the same path, only the degrees offered online are designed for working adults. Students studying online can earn their bachelor's or master's degree at their own pace, but they can potentially earn their degree in as little as 15 months, saving time and money along the way. Minot State University is often considered one of the most affordable schools in the nation for 4-year programs. All students studying at Minot - including those that live out-of-state or that are studying online - will receive in-state tuition, keeping this online program affordable. Their online program has multiple bachelor's degrees available, some of which are degree completion programs designed for transfer students. With over 18 years of online teaching experience, the affordability and quality of this program make it stand out. Originally a teacher's school, Valley City State University has included other areas of study while still placing an emphasis on their school of education. Through their online school, undergraduates can study toward 1 of 6 degrees geared specifically toward education. Other online programs are also available, including 2 master's degree programs -- one in teaching and the other in education. Minors and certifications are also offered online, making this an ideal school for future educators. North Dakota State Univeristy is among the top schools in the nation for agriculture and social sciences. While not all of their programs are available online, undergraduates can study toward 1 of 3 focuses on their way to earning a bachelor's in human development & family science. An entirely online bachelor's in sociology is also available, as are four minor options. The cost of online programs ranges depending on which state students are residents of. The oldest and largest school in the state, the University of North Dakota has a history of providing quality education. Their online program continues that trend, offering online tutoring and student services to all their students. There are also a wide range of degree programs available, some of which can be completed entirely online in a 4-year period. Other popular options include online degree completion programs for transfer students and accelerated bachelor's/master's programs, such as their 5-year public administration BS/MPA. Any online students that have previously studied through Mayville State University will notice that some things have changed. The school recently switched to the popular Blackboard Learn system, but they still offer the same 12 online programs they previously did. One benefit of studying at Mayville State is that online credits earned never expire, so students can take as long as they want to earn their degree - although many complete their education in the traditional 4-year period. An important part of southwest Dakota, Dickinson State University prepares students for careers in the region. However, the material covered through all their programs - including their online programs - can be used to begin a career anywhere. With 8 bachelor's degrees offered entirely online, Dickinson State online has options for most busy students. Also offered online is a master's in teaching which prepares students to become teachers at the secondary level. Founded with Christian faith and theology in mind, the majority of the programs at Trinity Bible College and Graduate School are focused on theological studies and ministry. TCB online provides access to some of these programs. The main online program, the bachelor's degree in biblical studies, is a 4-year program that can be combined with a master's through the accelerate program. The cost for all online programs is the same per credit regardless of where students live. In K-12, most online learning takes place after fifth grade. Students in grades 6-8 have access to supplemental online courses to facilitate two specific learning goals. First, to earn high school credits early. Second, to acquire any credits lost due to academic, family, health or other reasons. High school students in North Dakota have similar opportunities through the state’s Center for Distance Education, which offered more than 6,000 online courses in 2013. Students from 174 of the state’s 185 high schools took advantage of online learning that year. North Dakota’s higher education system includes five community colleges, six 4-year public universities, and six private nonprofit colleges. Ten of the state’s post-secondary schools have full online programs available in their course collections. The University of North Dakota offers online programs and courses through its Office of Extended Learning. Students pursuing this option are not restricted to enrolling at the beginning of the semester; depending on the class, they have the flexibility to sign up for classes on a monthly basis. The public school system provides North Dakota residents with access to five community colleges. The university system prides itself on offering students a different and unique experience at each of their campuses. In addition, North Dakota’s community colleges offer a number of courses and degrees that are not available at many conventional universities. For example, Dakota College at Bottineau, originally the North Dakota School of Forestry, places a strong emphasis on their natural resource programs and offers degrees in wildlife management, horticulture and agriculture. Other schools in the system provide programs in welding and basic machining, farm management and wind energy. Community colleges in North Dakota are small and all have fewer than 5,000 students enrolled at any given time. Professionals interested in technology and energy could complete one or more online undergraduate degrees at Bismarck State College. A Bachelor of Applied Science in Energy Management and an Associate in Applied Science in Electric Power Technology are some of the technology and energy related degrees. The college also offers online degrees in geographic information systems, management and human services. Similar to classroom courses, registration is required to start one of Bismarck State College's fully online programs. Adults must also apply to the school before admissions deadlines. After logging into the Online Course interface, students tap into their class schedules and their actual classes. The learning community at Minot State University is comprised of in-state, out-of-state and international students. Although finishing class assignments by deadline is critical to a student's overall success, emphasis is placed on class participation. This is where technology applications and software like Campus Connection and mobile applications come into play. Bachelor of Science online degrees are in management, international business and marketing. The school also offers Associate's degrees and Bachelor's degrees in applied sciences, human services and general studies. CCAF is the platform for Air Force members who are continuing their education remotely. Professionals who need additional training for meet licensing requirements can enroll in Driver Education. After making a time commitment of 6 to 12 hours a week, adults could complete an online degree in technology education, history, English, music and other liberal arts and science subjects at Valley City State University. Degrees like the Bachelor of Arts in Professional Communication take between 18 and 24 months to complete for adults who already have two years of coursework under their belt. Support with these intensive programs is provided with advising, counseling, technical help desk and distance education center resources. Non-credit classes are available through Ed2Go. Depending on state education laws, some programs may not be available to adults who reside outside of North Dakota. The mission of this small tribal college is to aide in the social, economic and cultural advancement of Indian families. Students can complete five diverse associate degrees completely online, including general studies, nutrition, business, education and criminal justice. The Associate of Applied Science in Nutrition and Foodservice gives students a theoretical and practical background in healthy food prep, food science and community nutrition. Graduates receive national ServSafe certification and can pursue Certified Dietary Manager credentials. All online classes at the school are taught asynchronously. Students do not have to attend online at a specific time and can complete their post-secondary education with little interruption to their work and family lives. Students can pursue several degrees, designed to directly prepare them for the workplace, through this state university's distance learning program. These encompass fields like business, education and nursing. The majority of the university's online courses are not self-paced and students usually follow a weekly schedule. An orientation is available to familiarize students with the Moodle learning management system, which is used to access courses and submit work. Most classes are offered on a regular semester schedule. This Catholic university offers a broad array of professionally focused bachelor's and master's degrees. Most are related to business, education or health care and provide a curriculum rooted in Benedictine values. The bachelor's degree in business administration equips students with tools like analytical thinking and effective decision-making, which can be directly applied in the workplace. Students learn how to address complex business issues like regulations, law and ethics from expert instructors. Online programs are structured so as not to interfere with students' lives outside school and courses are offered at an accelerated pace. Class sizes are small and most online programs can be completed in as little as 15 months. Students who don't want to take a break from their careers can pursue an array of bachelor's and master's degrees through the oldest university in North Dakota's distance learning program. The university's fully online Bachelor of Communication gives students the flexibility of attending classes online, while maintaining structure through semester-based courses and regular deadlines for assignments and exams. Students interact via a virtual classroom and receive a broad liberal arts education that can be applied to professions like journalism, advertising and media studies. The structure of online classes varies from program to program, with some requiring attendance at live web classes, while others do not. For those seeking a four-year degree, The North Dakota University System offers a choice between the state’s two research institutions and four regional universities. The University of North Dakota (UND) is the largest college in the system and provides 2,600 courses in over 200 fields of study including aerospace science, engineering and human development. Its affiliate, the University of North Dakota School of Law, is the only law school in the state. Despite its large enrollment, UND has an average class size of only 26 students. Smaller schools, such as Valley City State University, have fewer offerings and provide degrees in 80 fields of study. The public university system, as a whole, provides a cost effective option for students who enjoy nature. There are currently six private nonprofit colleges in North Dakota: Jamestown College, Trinity Bible College, University of Mary, Medcenter One College of Nursing, Rasmussen College and United Tribes Technical College. The first three of these schools are religiously affiliated, while Medcenter One College provides only nursing programs and the United Tribes Technical College exclusively educates students from the 75 federally recognized Native American tribes. North Dakota’s private schools, across the board, offer bachelor’s and master’s degrees in a number of fields; however, PhD programs are extremely limited. For example, University of Mary has one doctorate program in physical therapy, while Trinity Bible College does not have any. North Dakota State University (NDSU) offers online degrees and certificates for both undergraduate and graduate students. Undergraduates have degree options in human development and family science, pre-communication, sociology and university studies, which is a program in which students design a degree to meet unique goals and objectives. Graduate students can earn a master’s degree in a variety of areas, including mass communication, software engineering, merchandising and speech communication. Graduate level certificates are also available online in fields such as construction management, food protection, gerontology, youth development and family financial planning. NDSU also offers Web-based continuing education units, or CEUs. Many working professionals are required to complete CEUs on an ongoing basis in order to maintain licensure or certification or to advance their careers. Like other online schools in North Dakota, students attending NDSU can complete classes in a number of ways. Online courses can be completed 100 percent online, while blended learning courses require some classroom interaction. Some online courses incorporate CD or DVD instruction, and may or may not require students to submit work via mail. NDSU reports that all of its online classes have been accredited by the North Central Association of Colleges and Schools, the same regional accreditation agency that reviews the university’s classroom-based programs. Interested students must apply for admission before taking online classes or enrolling in an online degree program at NDSU. Graduate applicants must submit transcripts, test scores, a statement of purpose, and three recommendation letters with their application. Find out more about specific online programs and admission requirements at: http://www.ndsu.edu/dce/degrees. Students at the University of North Dakota (UND) have dozens of degree, certificate and class options. Online bachelor’s degrees are available in a range of areas, including chemical engineering, communication, electrical engineering and psychology. Master’s degree students can choose from options such as applied economics, aviation, public administration and space studies. More than a dozen graduate certificates are also offered in fields such as nursing, education and technology subjects. Common with programs at other online schools in North Dakota, these programs at UND are designed to accommodate both traditional and nontraditional students. UND’s online courses are delivered and managed via Blackboard. Online tutoring is available 24 hours a day in a variety of subject areas, including nursing, physics, statistics and Spanish. Technical support is also offered online, covering everything from email and file storage to software and security. More information about UND’s online programs and online student support services can be found at: http://distance.und.edu/. Bismarck State College’s (BSC) Online Campus connects students with dozens of online certificate and degree programs, and students enrolled in traditional programs can often complete at least some of their courses online, too. All distance learning students taking BSC classes online can take advantage of a number of student support services designed to help them succeed. The Tutoring/SmartThinking program, for instance, offers online tutoring in areas such as math, science, business and writing anytime, day or night. Other services include financial aid, testing, library access and even military veterans services. All of BSC’s online courses are regionally accredited by the Higher Learning Commission of the North Central Association of Colleges and Schools. BSC is similar to other online schools in North Dakota in that the distance education courses were designed with convenience in mind. Students access course material through the Pearson LearningStudio system, a Web-based platform where they can review class announcements and complete most assignments, quizzes, and tests. In some cases, students can actually log into classes on-the-go on their mobile devices via iOS and Android apps. Visit BSC Online Campus to review a complete listing of its online degree and course options, including special programs designed specifically for military students: http://www.bismarckstate.edu/online/. North Dakota shines as a mid-western state full of universities that pride themselves in creating civic-minded students. For those prospective students eager to serve their country, North Dakota will not disappoint. The state has an array of schools working with the ROTC Army, Navy and Air Force branches. This collaboration means graduate and undergraduate students in North Dakota can work with the ROTC while also earning their degree. The list below includes the nonprofit, four-year schools in North Dakota that boast at least two ROTC programs. North Dakota has so many colleges and universities to choose from with variables in cost, size and the strength of academic programs. For those who prosper with a close relationship with their mentors and teachers, the following nonprofit, four-year North Dakota schools keep their student/professor ratio at less than 20 students per faculty member. Considering that at least one of these schools has at least 5,000 students, that’s no small feat. With job openings in engineering and other technology-related fields, North Dakota is an excellent choice for women interested in pursuing careers in technology. There is support for women in the field through conferences and other opportunities. Also, though most online schools in North Dakota with STEM programs are still comprised of mostly male students, there are scholarships offered for female students that help make an education in tech easier and more affordable. These colleges and universities have made the cut for their focus on supporting their female technology students. With its top-notch, accredited programs, North Dakota is a great location for those interested in helping children and families as a social worker. The Bureau of Labor Statistics forecasts that jobs in social work are due to grow until 2020, and possibly beyond. Social workers are employed in a variety of settings from hospitals and private practices to schools and mental health facilities. Some social workers may have a bachelor’s degree in social work, or a BSW, though some may have a bachelor’s degree in psychology or sociology. Many positions require graduate studies.